work-structure Rows 1-3present the work as operating with a basic body-space topology: convex-concave, inside-outside, volume-skin-object relations. The rows invest drawing or image-acts to create shifting intervals and scales that resonate with or break-up effects of shifting body-spatial configurations and viewing modes.Sketches are excerpts from the video. Row 1, mediated body-movement (edited excerpts from dance films) makes a shifting front-back-turning tangible as a rhythmic flow, opening centrifugal-centripetal intensifying intervals and initiating spatial configurations. 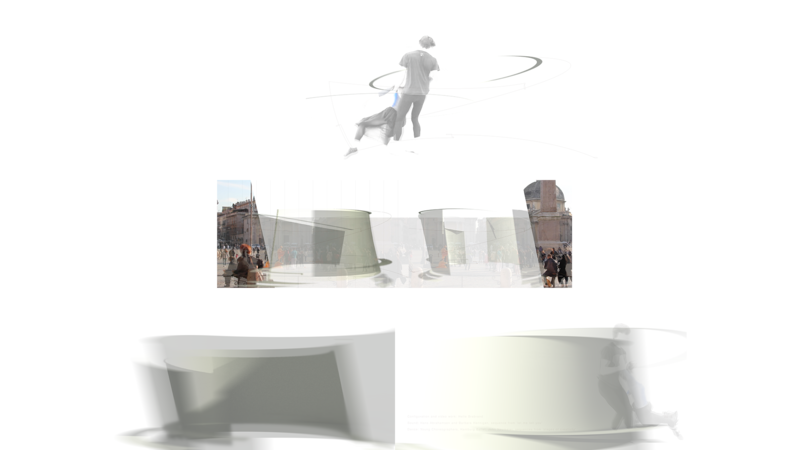 Row 2, animated surfaces that articulates shifting spatial turning, are seized by transverse operations in the image-plane, making masked video-layers present ‘other’ space-bodies and drawing modes. Moving the video-layers transversely transfers shifting viewing angle in ‘real’ space into parallax side to side attention in the image-plane. Row 3, dissolving volume-skin-object, body appearance and moving-modes makes the intervals flow in a rhythmic feeling of movement in gathering.